Ford Motor Company delivered four ethanol-fueled hybrids to the State of Missouri and Kansas City Power & Light this week. These four are part of 20 to be delivered to fleet customers in six states. The use of the vehicles will help expand Missouri's use of alternative energy. 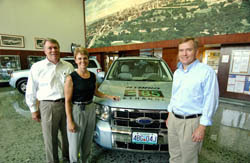 The Ford E85 Escape Hybrid is the world's first hybrid vehicle capable of operating on blends of fuel containing as much as 85 percent ethanol-- a renewable fuel that can be produced from American-grown corn. "My administration has and will continue to strongly encourage the use of these environmentally-friendly technologies,” said Gov. Matt Blunt. “The use of renewable fuels improves our environment and the air we breathe. With old-fashioned American ingenuity, like that displayed by the Ford Motor Company, we can become more energy independent. Our state is doing our part to look for alternative fuels to help lessen America’s dependence on foreign oil. The more clean-burning, renewable fuel Missouri produces and uses, the better off we will all be in the long-term." The E85 Escape Hybrid produces about 25 percent fewer greenhouse gas emissions than a gasoline-fueled Escape Hybrid. It also runs on a renewable fuel, which can help reduce this nation's dependence on imported oil.